For centuries the people of Polynesia have recognized the importance of breadfruit — called ‘ulu in Hawaiian and Samoan — as a source of food, lumber, and other materials. History and movie fans may remember Captain Bligh and HMS Bounty sailed to Tahiti in the late 1700s to retrieve breadfruit saplings and replant them in the Caribbean. Of course, that particular voyage ended in an infamous mutiny, but today breadfruit is widely used in tropical countries around the world — in more ways than just as a doughy food staple. Ripening breadfruit in Laie, Hawaii. Just as some people smell or thump fruit to tell if it’s ripe, those familiar with breadfruit look for roundness, a more yellow hue, the flattening of the scaly pattern in the skin, milky sap running down the sides of the fruit and other methods. Of course, there are hundreds of varieties of breadfruit around the world where different methods may also be used to determine breadfruit ripeness. That’s one of the reasons the Polynesian Cultural Center co-hosted the 2018 Global Breadfruit, Technology & Health Summit in Laie from October 15-17, 2018. Participants held most of their morning sessions in the Center’s Hawaiian Journey Theater and toured the PCC villages to see how our various islanders prepare and use breadfruit. They included government officials, doctors, university professors, scientists, cultural practitioners, bakers, chefs, culinary program people, and other ‘ulu advocates. ♦ Courtyard Marriott North Shore: Toleafoa Dave Betham, General Manager. ♦ The Pacific Business Center Program (PBCP) in the Shidler School of Business at the University of Hawaii/Manoa: Papali’i Dr. Failautusi “Tusi” Avegalio, director. ♦ Khaled Dudin, director of Caravan Arabia LLC, which sponsored the travel of all Pacific islands participants as well as the out-of-state keynote and other speakers. Dudin is also the point of contact to the PBCP for veterans business development, entrepreneurial and agricultural development opportunities in the Pacific. 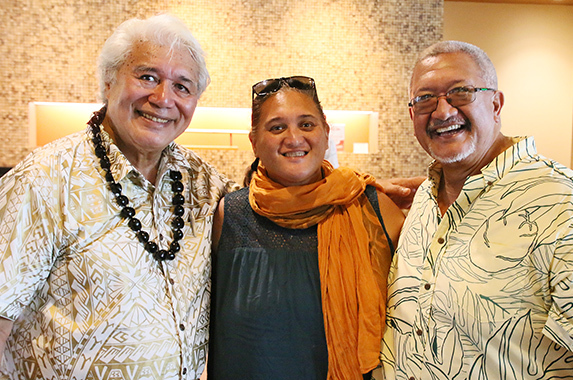 (Left-right) Breadfruit conference organizer Papali’i Dr. Failautusi “Tusi” Avegalio, director of the Pacific Business Center Program at the University of Hawaii/Manoa; and participants Pomai Bertelmann and her husband, master navigator Chadd Paishon. ♦ Breadfruit flour — milled from dried grits — “is gluten-free and has a low glycemic index, making it a natural organic food that counters both diabetes and obesity. In flour form, it is a more nutritious and tastier replacement product for wheat flour; particularly, for Pacific peoples where diabetes and ancillary health issues of obesity and hypertension are the leading cause of death in the world,” Dr. Avegalio said. ♦ The Hawaiian Village used boiled breadfruit (instead of the usual taro) to make poi ‘ulu, which they pound and mix with water into a pasty consistency. ♦ The Samoan Village men cooked the delicacy taufolo, where they knead caramelized sugar and coconut milk into baked breadfruit. ♦ Tongan Villagers reviewed the medicinal uses and preparation of breadfruit, which they call mei. They also gave the conference attendees samples of mei lolo’i, a common dish of breadfruit mixed with coconut milk. ♦ Tahitian Villagers demonstrated how they char breadfruit or ‘uru on an open fire, carefully peel away the burned outer skin, and then pound the inner flesh while adding coconut milk to make ‘uru tahaari. ♦ The Fijian Village demonstrated the preparation of uto bolomo, which is unique to the Fijian island of Kadavu. First, they roast the breadfruit over a fire, then carefully use water to help scrape off the charred skin without mixing it with the flesh, and then pound the doughy breadfruit on a flat surface. 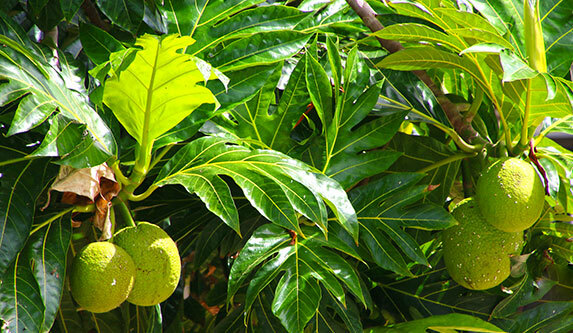 ♦ Dr. Jeff Gwirtz, president of Kansas-based JAG Service Inc. — and a leading global expert on milling science, technology and flour making — has been focusing his expertise in processing, product development and commercialization on breadfruit. He is also involved in getting “newly developed multi-purpose driers to…breadfruit producing islands in Oceania to dry, sack and ship dried grits to Hawaii for processing and flour making,” Dr. Avegalio said. ♦ Dr. Roger Pulwarty, a senior NOAA science advisor on climate who is originally from Trinidad and Tobago, cited the vulnerability of Pacific islands to the impact of climate change, and encouraged more local production of food. “The breadfruit and coconut trees have been the survival food and water sources of Oceania for millenia,” Dr. Avegalio said. ♦ Tautaituasivi Tagaloa Eddie Wilson, who led efforts to lift the ban on Pacific kava and restore its global exports, told the summit attendees, “the breadfruit initiative is starting the right way, as a family.” Wilson, chairman of the International Kava Executive Council and president of the Pacific Kava Association, also said it was the lack of processing and export quality standards that nearly destroyed their industry. ♦ Michael J. Lurvey, a scientist, introduced the TCOM system (thermal conversion of organic materials) he invented to convert waste to energy. It could also help clean up noxious landfill dumps, making them available again for more valuable human uses. 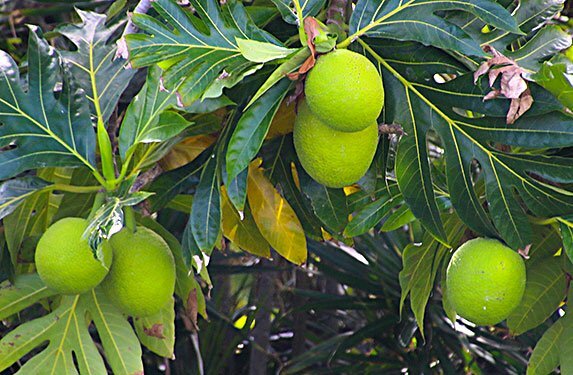 ♦ Dr. Sela Panapasa, who is originally from Rotuma in Fiji and is now a research scientist at the University of Michigan, cited the health implications of using breadfruit. Breadfruit, with its low glycemic index, along with other taro and banana products could supplant food imports and save thousands of lives including those of the unborn. Returning to traditional foods such as breadfruit with new culinary product innovations — such as ice cream, pasta, cereal, cheesecake etc. — could also attract local island consumers, especially children, to avoid the imported versions. ♦ Summit participant Craig Elevitch, an educator in agroforestry and sustainable human agroecosystems since 1991, co-wrote the Breadfruit Production Guide: Recommended practices for growing, harvesting and handling for the Hawaii State Department of Agriculture, which is available as a free PDF download. The booklet is a primer that helps readers learn the best practices for planting, establishing and managing breadfruit trees, and more. 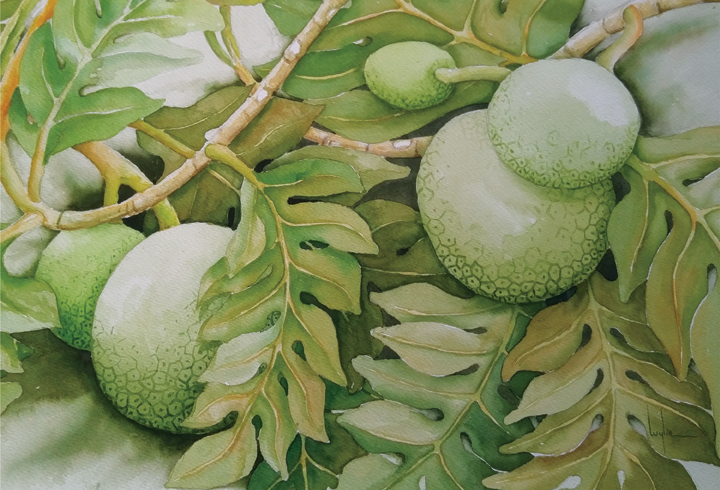 The culinary side of the booklet explores cooking breadfruit like a potato, making chips and snacks, pounding it into pa’i ‘ai — the first stage of making Hawaiian poi, and milling it into flour for baking and use in other cooked products. ♦ Tina Fonoimoana Reid, speaking as part of a panel, said she uses breadfruit flour and Samoan koko (100% locally-grown cacao) in products she makes at her Cheat Day café and bakery in Nu’uuli, American Samoa. Other summit participants “raved about” her lemon bars and banana-koko Samoa brownie samples. Tina, who is originally from Laie, is the daughter of senior PCC missionary Sister Janet Fonoimoana-Settle. 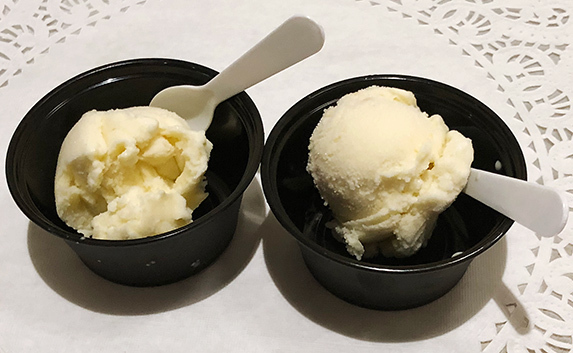 Samples of Uncle Pono’s ‘ulu ice cream. ♦ Mariposa Blanco, a lomilomi, or Hawaiian massage, practitioner with Hui Ho’ola O Na Nahulu O Hawaii on the Big Island, advocates using breadfruit flour. She added they also make latino-style tamales but use breadfruit pa’i ‘ai mixed with coconut cream inside the wrappers. ♦ And Aunty Shirley Ann Kauhaihao, a cultural practitioner on the Big Island and founder of Ho’oulu ka ‘Ulu said breadfruit poi is “very good.” She explained she steams the breadfruit “to keep it moister” before pounding it into poi. She also dices cooked breadfruit and adds it to Hawaiian-style lomilomi salmon. “There’s so much we can do with ‘ulu,” Aunty Shirley told the participants. Breadfruit ripening in Laie, Hawaii. In addition to boiling, baking or roasting, some people deep-fry it into chips, or mix it with Hawaiian taro poi. Pounders Restaurant at the Polynesian Cultural Center also mixes it about 1:1 with potatoes and serves it as a side-dish, Ulu Mash. ♦ Pomai Bertelmann, who’s sailed on the Hokule’a and Makali’i voyaging canoes, and works as a middle-school instructor at the Kanu o Ka ‘Āina New Century Public Charter School in Waimea on the Big Island, said she’s also interested in getting more breadfruit, kalo (taro) and other traditional foods into the school’s lunch and agricultural programs. ♦ And her husband, master navigator Chadd Paishon from the Big Island said he’s trying to develop a breadfruit-based survival food like ancient Polynesians used on their open-ocean voyages. He wants to carry it as provisions when his home-canoe, the Makali’i, sails to the northern Hawaiian islands on their next voyage. Paishon recalled an experience when he sailed years ago aboard the Hokule’a voyaging canoe with the late Pius “Mau” Piailug, the master navigator from Satawal in the Caroline Islands of Micronesia who re-introduced traditional way-finding to Hawaiians and other Pacific islanders. Paishon recalled “Papa Mau” did not eat the crew’s provisions on that voyage, but rather ate something his daughter had tightly wrapped in leaves and delivered to him before the canoe sailed. When Papa Mau offered some to Paishon, he discovered it was a pungent type of breadfruit mix. One conference attendee said this sounded a lot like masi Samoa — not the modern cracker, but an ancient form of fermented breadfruit and other island staples the people used on long ocean voyages as well as food storage against starvation in times of famine. Apparently, they would mash the breadfruit, put it in a lined hole in the ground, tightly cover and bury it — sometimes for years, then dig it up when they needed it. ♦ “The Honolulu City Council and the Hawaii State Legislature are now supportive of our goal to engage the issue of a Hawaii-based flour mill...and making it the hub to convert dried breadfruit from other Pacific islands into flour for product development, manufacturing and export,” he said. This includes the ideas of mini-mills in other parts of the state and retooling existing but aging facilities vs. building new infrastructure. ♦ PCC Samoan cultural ambassador Kap Te’o-Tafiti — for his integrity in introducing breadfruit and other traditional food preparation practices to millions of people. ♦ And PCC Pounders Restaurant executive chef Felix Tai — for introducing innovative dishes using traditional island food, including breadfruit. ♦ Dr. Fadi Aramouni for his work at Kansas State University in breadfruit product development and food safety. ♦ Dr. Jeff Gwirtz for his work on processing breadfruit flour. ♦ Orson Swindle, former Commissioner of the US Federal Trade Commission and Assistant Secretary, US Department of Commerce, for his work in honoring veterans involved in agriculture and technology for economic development and environmental responsibility. ♦ Hani Farsi delivered the closing keynote address on “applying Pacific micro solutions to global challenges.” An entrepreneur and philanthropist, he is also involved with the thermal conversion of organic materials (TCOM) project. ♦ Aunty Shirley Ann Kauhaihao received the Ka’ulu Kupa’a Award and Recognition at the outset of the conference. ♦ Bill Thomas, Senior Lead-Islands, Indigenous and International Engagement Office for Coastal Management/National Oceanic & Atmospheric Administration ( NOAA) Ocean Service, and a Hawaiian who is concerned with bringing Oceania and indigenous people to the forefront on federal discussions, planning and policy. ♦ Afamasaga Faamatala Toleafoa, chairman of the board of the Pacific Islands Farmers Association (PIFON), which currently represents 19 farmer organizations with a combined membership of almost 80,000, accepted the 2018 Breadfruit Summit Regional/Global Award on behalf of PIFON manager, Kyle Stice (who had prior commitments), for the promotion of regional collaboration. ♦ Chef Todd Manley of St. Croix, US Virgin Islands, for his work using alcohol distilled from breadfruit. ♦ Ione Lutip Heine deBrum, mayor of Ebon Island Atoll, Republic of the Marshall Islands, has been promoting local food security and agriculture marketing development programs since she took office in 2012. ♦ Dame Tadia Rice, a leadership and management consultant, and organizational dynamics expert who now lives in Hawaii. She most recently received the 2017 Ellis Island Medal of Honor from the National Ethnic Coalition of Organizations. “It’s an interesting paradox that the key to all things of the future is the child,” Dr. Avegalio said in his summary report on the conference, citing an experience master navigator Chadd Paishon shared in the summit’s concluding keynote address. “If the answer is yes to all four, the future is indeed bright and the elders can rest in peace. Soifua,” he said.